Modern highly parallel GPU systems require high-bandwidth DRAM I/O interfaces that can consume a significant amount of energy. This energy increases in proportion to the number of '1' values in the data transactions due to the asymmetric energy consumption of Pseudo Open Drain (POD) I/O interfaces in contemporary Graphics DDR SDRAMs. In this work, we describe a technique to save energy by reducing the energy-expensive '1' values in the DRAM interface. We observe that multiple data elements within a single cache line/sector are often similar to one another. We exploit this characteristic to encode each transfer to the DRAM such that there is one reference copy of the data, with remaining similar data items being encoded predominantly as '0' values. 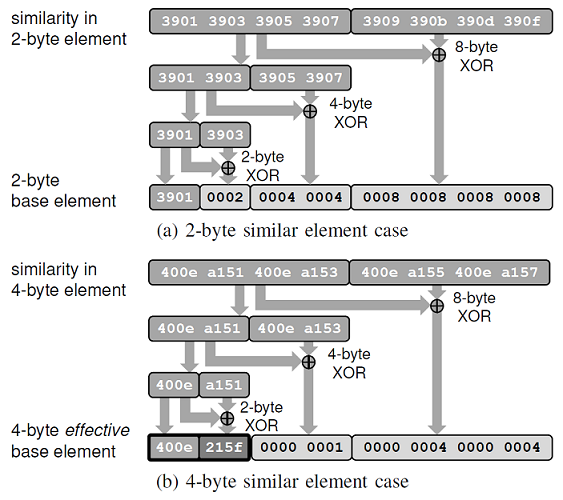 Our proposed low energy data transfer mechanism, Base+XOR Transfer, encodes the data-similar portion by performing XOR operations between data elements within a single DRAM transaction. We address two challenges that influence the efficiency of our mechanism, i) the frequent appearance of zero data elements in transactions, and ii) the diversity in the underlying size of data types within a transaction. We describe two techniques, Zero Data Remapping and Universal Base+XOR Transfer, to efficiently address these issues. Our proposed encoding scheme requires no additional metadata or changes to existing DRAM devices. We evaluate our mechanism on a modern high performance GPU system with a variety of graphics and compute workloads. We show that our mechanism reduces energy-expensive '1' values by 35.3% with minimal overheads, and combining our mechanism with Dynamic Bus Inversion (DBI) reduces 1 values by 48.2% on average. These '1' value reductions lead to 5.8% and 7.1% DRAM energy savings, respectively.